my tank and whether or not it’s beneficial or not? 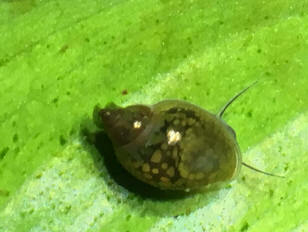 hello, I need some help identifying this snail, I think its eggs where in the plant I got and I only have one big one and I think its laying more eggs, I have also noticed other little things moving around on the side of the tank so I need help Identifying the big snail so I can find out if the little things are baby snails or something dangerous. Just picked up some Cabomba and I saw this little fella in the isolation tank. Sent with Alien Technology.... They are watching you.........through your own camera. through the site and the shape of the shell looks sort of like the tadpole snail, but I'm not sure. I'm in the US if that helps. Thanks so much! thank you in advance for your help! I've read your snail id/info, but can't tell if these little guys in my tank are Malaysian Trumpet snails (or similar) or Assassin snails. I'm concerned for the well being of my horned Nerite, if they're assassins. I've removed him from the tank for now. They must have come in with some shrimp or a Nerite about 3 weeks ago and were first noticed 2 days ago. Photo are attached. They're more active at night, but I still see some during the day. 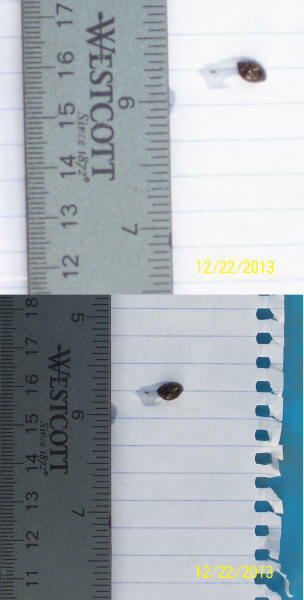 some are the size of a grain of pepper, the largest I've seen is the size of a grain of rice. 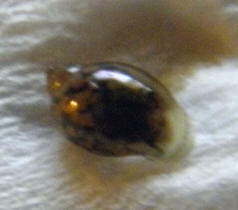 Last night there were several crawling on the Nerite, so I removed him, just in case. Thank you for your website. It's a great resource! <So see a page on my personal web space, at the link below, for a photo of a juvenile Clea helena; they're usually quite distinctive by the time you see them emerge from the sand. Thank you for the links, and info. Is your guess Clea helena then? Yes, I did compare the photos. I didn't know if it was the coloring I was looking to match or the grooves. <Ah, the coloration; most/many of the higher gastropods have grooves of some sort or another on the shell. Habit should be a better distinction. It didn't seen to match to me, but wanted to make sure I wasn't misunderstanding the reason you sent the links. they will crawl on the underside of a translucent slim at the water level. all up and down the sides of the tank. the eggs look like clear gel globs. the one pictured is about medium size of the ones I have seen. Thank you for any help, I definitely want to know what I am dealing with. I was doing the routine weekly water change last Sunday (May 18) and two days later I noticed a very small conch shell (about 3/4th of an inch). I was surprised and took it out with a net. I believe that it came with the tap water. The tap water I am talking about is not the drinking water, but it is pumped from the bore well in my apartment complex. I did not add anything else in the tank that this shell may have come with (no plants, no rocks). algae. Since I had cleaned my tank recently, there was not much left, so I left few mushroom piece in his jar. I also gave some small pebbles with bit of algae from the fish tank. My question is that, sometimes, he reaches to the top of the water (along the wall of the jar) at night, so I was wondering if this is because of lack of oxygen? I throw about 90% of water everyday and replenish with tap water. Should I be adding de-chlorinator like I do for my fish tank? I will appreciate if you could give me any information on how to keep him alive. Okay I do see that there is some material on shells at WWM (though most of the talk about salt water aquariums). I also noticed one of the answers suggesting to feed the shell sea-weed. I will do that, too. Oh sorry! I should have sent a picture. Here it is attached. With the hard shell around it, I did not think it was a snail, but then I barely know anything about them. If you could please help me Id this snail so i can find out if this one is Good/Bad! The problem: I accepted some plants from a neighbour. It seems that there were some snails in the plants and now there are some snails in my tank. I fear that there may be many snails. The steps I have taken: First step: Identify the snails. 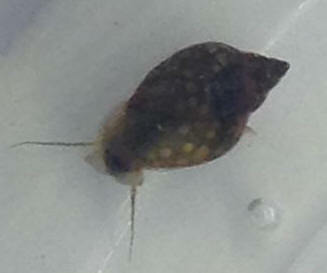 The largest is very small, but I want to act fast if this is the beginning of an infestation, so I took the attached photos. 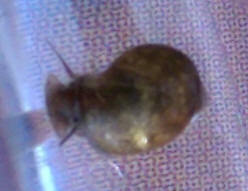 The first and third are of a snail and are unfortunately rather blurry owing to their size and the poor quality of my cell phone. 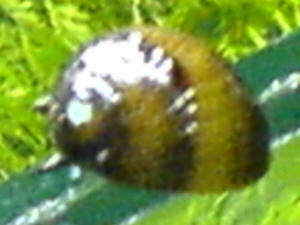 The snail is attached to the glass at about the centre of the first photo. The snail is at the bottom left of the third photo. 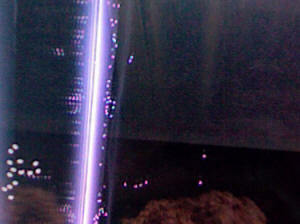 The second shows white spots which I am seeing on the glass of the tank and on plant leaves. 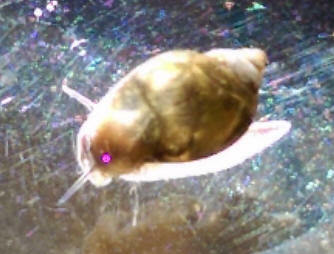 The only thing I can see in your material which looks like this is a snail you have identified as a Planorbis or Ramshorn snail. It seems that these can become a serious pest and destroy plants. 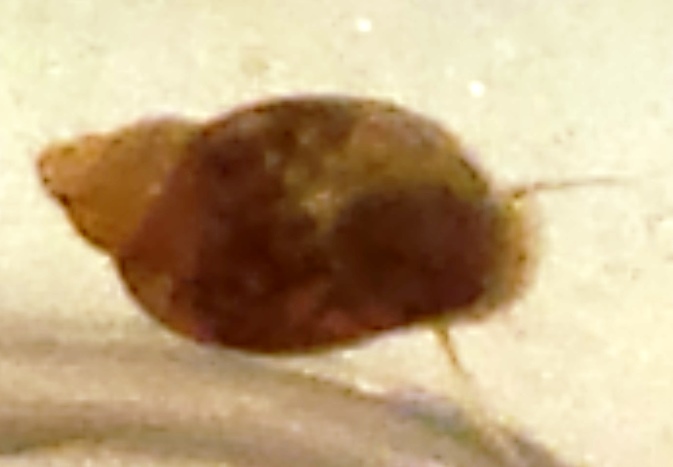 Second step: Assuming that I have correctly identified the snails and I do need to take steps to avoid an infestation, it seems that a good way to deal with them is to buy some Clea helena or assassin snails. Third step: Check with the people at WWM before acting in case I am incorrect and make things horribly worse. 1. Have I correctly identified the snails? 2. Is it true that they will wreak havoc with the plants? 3. If I must take action, what should I try first? I have seen it suggested that I put vegetable matter in at night and remove it in the morning. Will this just put off the problem? 4. Should I go straight to the Clea helena? Is it true that I would need 5 to 6 Clea helena to control the problem? 5. Can my tank sustain 5 to 6 Clea helena? Will they leave enough algae for the Nerite snails? 6. Will I ever be free of snails without starting over? As always, I am enormously grateful for your help with this. Would you mind trying to I.D. this snail for me? It would appears that some hitched a ride in on some plants that I ordered which have been in a cycling, unstocked (fish) tank for one week. This is the biggest (about 0.5 cm long), but a few more 'babies' seem to appear each day (last count ~10 individuals visible). Should I remove them or let them be? I live in Singapore, if that helps your I.D. attempts. 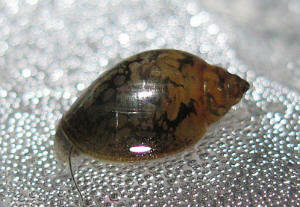 <It's a Physa or Physella species, of the sort often called Tadpole Snails. 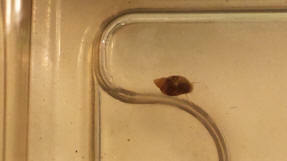 This evening I was looking at my 20 gallon long planted tank when I saw a tiny snail on a piece of driftwood. I attached a photo. Do you know what it is? I recently bought a pair of Apple Snails (which I think are both female, but it remains to be seen if I am correct), and a bunch of cherry shrimp along with a little bit of Java Moss. Thanks heaps for any help you could provide me with and sorry about the pic being a bit fuzzy/out of focus as he is sooo tiny it was super hard to get any pic of him at all (he's on a tissue). Oh, and I'm from Australia if that helps any. There seem to be snail eggs in my daughters fish tank. From what I've researched, she has two gray mystery snails from PetSmart. It seems these eggs should have been laid above the water line. Maybe there wasn't enough room up there or maybe they fell, because they are in the bottom of the tank and the number of eggs has decreased, dramatically. Maybe more than half are gone. Is there any chance that some of these could hatch under water? If not, I'd rather get them out of the tank while my daughter is visiting with her cousins...which gives me 2 days. They are practically all gone now. Too bad. I'll make sure we keep a lower water line so there is some space at the top of the tank for next time. Lol...I just saw your comments about omelets! Can you please identify this type/class of snail for me. He was purchased @ a local Pet Store 4 months ago or so. See attached pics. conditioner, I think he is okay, but am worried about the possible issues that may be plaguing his health. He is active again at this point but not to the extent he was previously, before the altercation. He is not acting the same i.e. 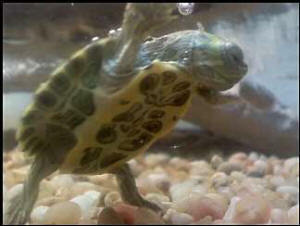 : not sliding over the remnants of the tank, like he did before. He used to cruise around in a speedy fashion on a regular basis. Now he is only sticking his body to items near the filter of the tank & hanging out on the temperature gauge, not moving around a lot at all. He is out of his shell somewhat, but not like before as you can see in the Pics. 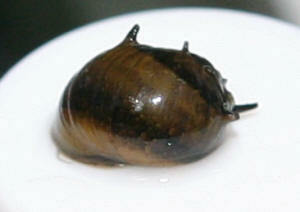 Spruce Creek River Snail 9/23/05 While fishing in the spruce creek river, Florida. I noticed snails on the rocks , a lot of them everywhere .A friend told me that species only lives in this river. He didn't know the name of the snails. They have a conch shape with spikes on the cone end , and the biggest is 3" long. Can you tell me about this guys and if there safe for aquarium life. Oh this river is about 10 miles south of Daytona Beach . 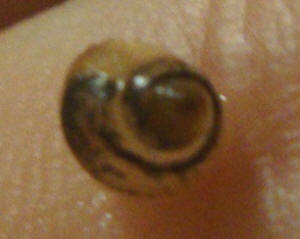 >> Without a photo it is difficult to say what species of snail this is. What fish were you catching? Is the water brackish, or are you very close to the estuary? 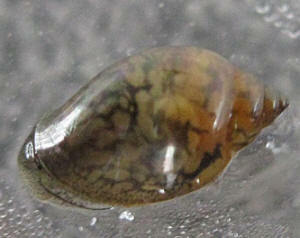 Do you want to put the snail in a freshwater or saltwater aquarium? What else is in the aquarium now? 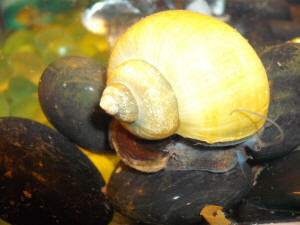 Snails may bring in parasites, or eat the other animals and plants in your tank. Without knowing more about it I would not recommend putting it in your tank. Good Luck, Oliver.